Gunda Huskobla is Managing Director of the Graduate Academy of Friedrich Schiller University Jena in Germany. Her concern is to enhance and effectively secure the quality of doctoral education in order to provide young researchers with the best possible qualifications for future assignments both within and outside academia. She is also Head of Office of the German University Association for Advanced Graduate Training (UniWiND/GUAT) and co-chairs the Coimbra Group Working Group on Doctoral Studies. Her background is in business administration. She holds a PhD in Economics and did research on organisational development and change in the field of strategic management. 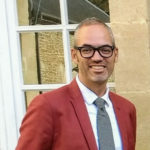 Jean-Marie Pincemin is the International Relations Office Interim Director of the University of Poitiers. He has worked as a Horizon2020 Marie Skɫodowska Curie Actions NCP (National Contact Point) for France since 2015. He has also been a member of the Doctoral Studies Working Group (Coimbra Group) since 2011. He organizes trainings and workshops on the use of networking and social media for improved scientific visibility & employability. Doctoral Studies constitute a key activity and major priority for multi-disciplinary research universities and represent one of the most important contributions of universities to the development of societies, requiring creative and collaborative approaches by universities. Substantial reform of doctoral studies has taken place across Europe over recent years, and the challenges of implementation and consolidation are central to the strategies of universities. The main remit of the working group on Doctoral Studies is on an exchange of information, sharing of best and innovative practice and joint activities of Coimbra Group Universities in the organization of doctoral studies and of early research careers. In this context, Coimbra Group Universities aim at increasing their participation in European research and education projects. At the same time, the expertise of the working group members is an excellent basis for possible contributions of the Coimbra Group to European policy-making relating to doctoral studies and early research careers. 3MT (3-Minute Thesis) Competition: In 2017 the Coimbra Group held its first 3MT competition on initiative of the DS working group. It is a research communication competition developed by the University of Queensland. The competition requires doctoral researchers to effectively explain their research to a non-specialist audience in three minutes with one slide. Within the Coimbra Group, the competition draws a lively picture of the variety and capability of doctoral research at the member universities. Joint CG-UNICA PhD workshop: On a regular basis, a joint CG-UNICA international training workshop for doctoral candidates on career preparation is offered. It creates a ground of common understanding, increases mobility of doctoral candidates of the member universities and initiates possible international and interdisciplinary cooperation of early-stage researchers. Supervision training and support: Both the PhD awarding institutions and the supervisors themselves bear responsibility for ensuring adequate support. Following workshops on good doctoral supervision, work will commence on a publication. The paper will collate existing resources from the CG members with the aim of determining a set of universal recommendations on how to support good doctoral supervision as well as highlighting a broad range of promising institutional practices. Quality Assurance and Enhancement: The aim is to compare doctoral studies evaluation approaches at Coimbra Group member universities. So far a scoping study was conducted. The next step will be to work on a publication of the survey findings amended by examples of good practice. This will lead to an exchange of information on QA&E in the field of doctoral education as well as to sharing good and innovative practices. Good academic practice: While this may be a never ending hot topic, the intention of the working group members would not be to address existing frameworks and guidelines on good research practice, but rather to consider how universities might work on creating an awareness for research integrity and on how doctoral candidates are trained. Participation in research and education projects with focus on doctoral education: Currently, it is planned to deliver thematic input and expertise to a capacity building project on the internationalisation of PhD studies in South Africa (Erasmus+ project “YEBO!”).